If you are looking for the solution on how to turn off Cortana in Windows 10, then you have landed on the perfectly crafted guide on turning off Cortana on Windows 10 operating system based PCs. No matter how smart is the Personal Assistance is on Windows 10 or any other OS, but an AI can’t match the level of Humans. The Windows 10 powered PC and laptop are now having an AI (Artificial Intelligence) support. 1.3 How to Turn Off Cortana in Windows 10? With this, all Windows 10 operating system based computer users can interact with their PC. Cortana might be very useful features for some users but most of the users don’t even use once in their life, so there is no doubt that, Cortana is extremely useful in many cases, which is the best Digital Assistance in Windows PC. The fact is that Cortana can sense commands and can let the users do some of the basic tasks without any physical connection. However, not everyone will adore the capabilities of Cortana, as AI system still needs more functionalities. People those, who rarely use it might like to know about the complete procedure to disable Cortana Windows10 home. On the Windows 10 Anniversary update, Microsoft removed the option to turn it off. It is not fair those who don’t use the features of Cortana. So, if you are one of them, who want to know the procedure to turn off Cortana in Windows 10 then check out this complete in-depth guide. Cortana is a virtual assistant created by Microsoft for Windows 10, Windows 10 Mobile, Windows Phone 8.1, Invoke Smart Speaker, Microsoft Band, Xbox One, iOS, Android, Windows Mixed Reality, and soon it will available on Amazon Alexa according to Wikipedia. Cortana can set reminders, recognize natural voice without the requirement for keyboard input, and answer questions using information from the Bing Search Engine. Cortana is currently available in English, Portuguese, French, German, Italian, Spanish, Chinese, and Japanese Language editions and it also depends on the platform and region in which the Windows device being used. Cortana mainly competes against assistants such as Apple Siri, Google Assistant, and Amazon Alexa. Cortana was showcased the first time at the Microsoft BUILD Developer Conference in San Francisco. It has been launched as a key ingredient of Microsoft’s planned “Makeover” of the future operating systems for Windows phone or Windows. Cortana can help you out with some tasks, like if your device is locked, including setting a timer, playing music, or taking a quick note. This feature is on by default, but you can turn it off at any time in Cortana > Settings. In addition, in settings, you can choose to allow Cortana to access your calendar, email, messages, and other content data when the device is locked. To use Cortana on the lock screen, simply tap on Cortana or say “Hey Cortana”. If you don’t see Cortana’s icon on your lock screen on Windows, go to Settings > Personalisation > Lock Screen and set your background to Picture or Slideshow, and turn on the Get Fun Facts, Tips and much more from Cortana. Even if a user doesn’t use the Cortana, there are plenty of users do not need this Digital Assistant because it is too hard to change our interactions with our devices. For them, here is an answer to turn off Microsoft build Cortana assistant. On the top side, turn off the toggle switch. Turning off this toggle option, you will not receive any suggestion, alert, reminder etc. from Cortana. Also, it will be clear all things that Cortana has learned from you but this is not the end of the process. You will need to wipe out more from Cortana’s brain. It’s a brain is in your Microsoft account. To completely erase data from Cortana, you need to go through your Microsoft account or Bing account. For this check out more information on “How to turn off Cortana in Windows 10”? On the right side of the page, click on Sign In. Don’t worry about Bing account, it is a Microsoft site, where you can connect with your Microsoft account. 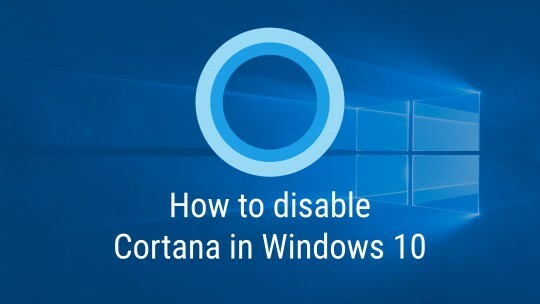 So, by performing all the methods, you can easily disable Cortana in Windows 10. So, follow the above methods, which we have showed you in the two different procedures. Though Cortana is a smart voice assistant it is still not useful enough for most Windows 10 users. Follow the steps to turn off Cortana in Windows 10 and disable it if you rarely use this feature. Let us know if you have any queries related to Windows 10 Cortana disable by commenting below. We will come back to you as fix your Windows related issues.